As bank contact centers transition from service hubs to sales centers. It is instructive to investigate which service attributes and behaviors will yield the most ROI in terms of driving sales through the contact center channel. Previously we explored which service attributes will yield the most ROI in terms of driving purchase intent. Beyond the attributes measured in the previous post, Kinesis also performed mystery shop observations of specific behaviors across six institutions with national scope to determine their relationship to purchase intent. While the importance of a good first impression is true, across the four greeting behaviors measured, there does not appear to any significant differences between shops with positive purchase intent and shops with negative purchase intent. This is mostly due to the high rate of performance across these greeting behaviors. Greetings are strong across all shops regardless of purchase intent. With respect to broader service behaviors, the behaviors with the largest gaps between shops with positive purchase intent and those with negative purchase intent are: suggesting additional products and asking for the business (each with about 2 times as many shoppers who experience positive purchase intent observing these behaviors compared to shoppers who experience negative purchase intent). Use name, use of understandable descriptions and clarity of speech round out the next three. When the shopper was placed on hold, five behaviors were measured. 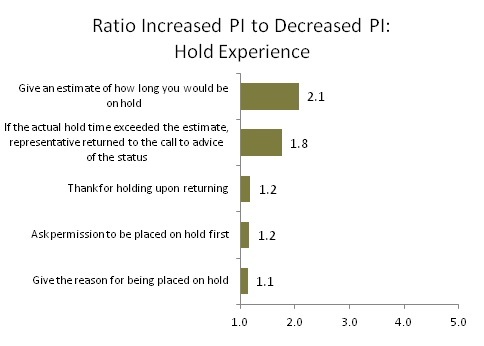 Of these, giving an estimate of how long the customer will be on hold, and returning if the hold time exceed the original estimate to advice of the status of the call were the behaviors with the strongest relationship to purchase intent. Again, both with about 2 times as many shoppers who experienced positive purchase intent observing these behaviors compared to shoppers who experienced negative purchase intent. 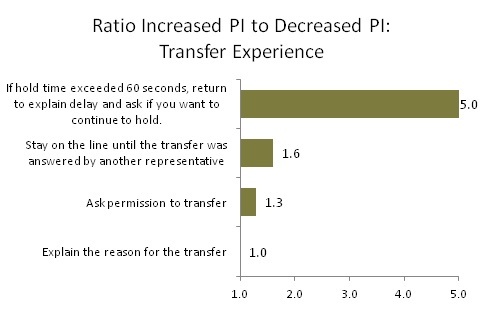 Additionally, five transfer behaviors were measured. Of these, the behavior with the strongest relationship to purchase intent by far is returning to explain any delay after 60 seconds. With five times as many shoppers who reported positive purchase intent observing this behavior relative to those who reported negative purchase intent. Finally, at the conclusion of the call, asking how else the agent could be of assistance and thanking the shopper for choosing the institution were the two behaviors with the strongest relationship to purchase intent. Of the behaviors measured, a couple of common themes tend to be present in the behaviors with strong relationships to purchase intent. The behaviors with strong relationships to purchase intent tend to deal with the themes of personalized service and valuing the customer. To maximize purchase intent, focus agents on behaviors which personalize the service in an empathetic manner (care for the customer and their needs) and value their business. Click here for a cross-tabulation of the raw data by purchase intent. Historically, bank contact centers have served primarily as service hubs, serving customers who call for information or are seeking assistance dealing with a problem in need of resolution. 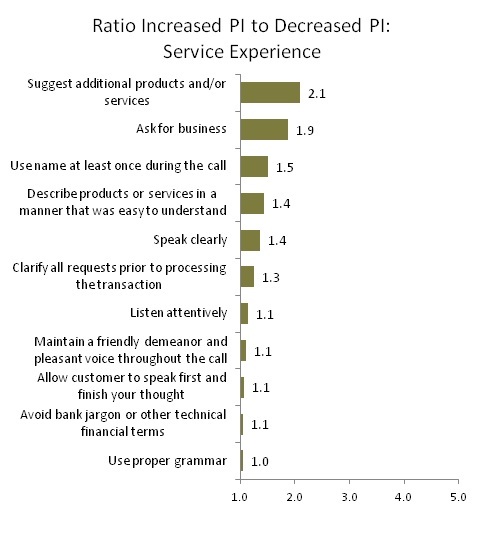 As banks continue to transition into an omni-channel model where customers can interact with the institution across a broad spectrum of channels, the contact center is transitioning into a sales hub, where customers who have researched a product online may still want to speak with a person prior to completing the purchase. As a result, contact center agents will require a new set of sales skills. 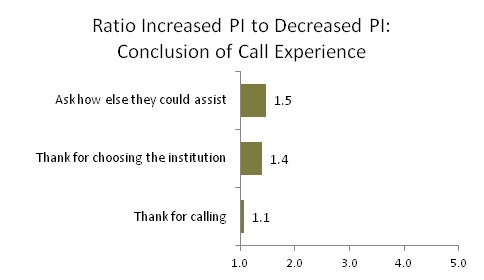 To help understand some of the new skill sets required of contact center agents as they transition from a service to sales role, Kinesis conducted mystery shops of six institutions with national scope to identify what customer experience attributes will yield the most ROI in supporting this sales role. Our conclusion is customers want empathy and competence. They want agents who both care about their needs and can satisfy those needs. Kinesis performed an analysis of purchase intent to identify the attributes with the most potential for ROI in supporting a sales role. We asked shoppers to rate the experience across a spectrum of service attributes on a 5-point scale where 1 is poor and 5 is excellent; as well assigning a purchase intent rating on a similar 5-point scale. We then cross tabulated the results by purchase intent to identify which attributes have the largest gap between shops which reported positive purchase intent and those which reported negative purchase intent. 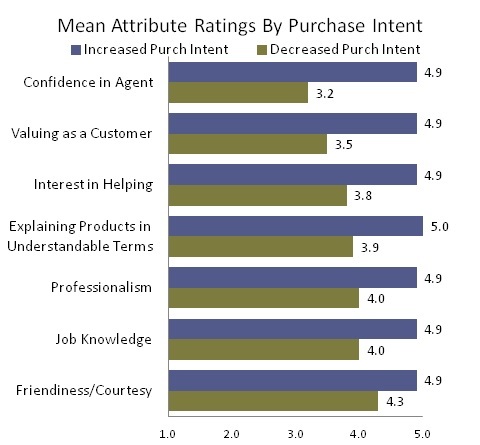 Confidence in the Agent, valuing as a customer, interest in helping and explain the products in understandable terms are the four attributes with largest gaps between shops with positive purchase intent and negative, followed by professionalism and job knowledge. Friendliness/courtesy was the attribute with the smallest gap. While friendliness is important, when it comes to driving purchase intent, the attributes with the largest gaps are those related to care and competence. Customers want agents who care about their needs, and are capable of delivering on those needs. In a following post we will look at the relationship of specific sales and service behaviors to purchase intent. 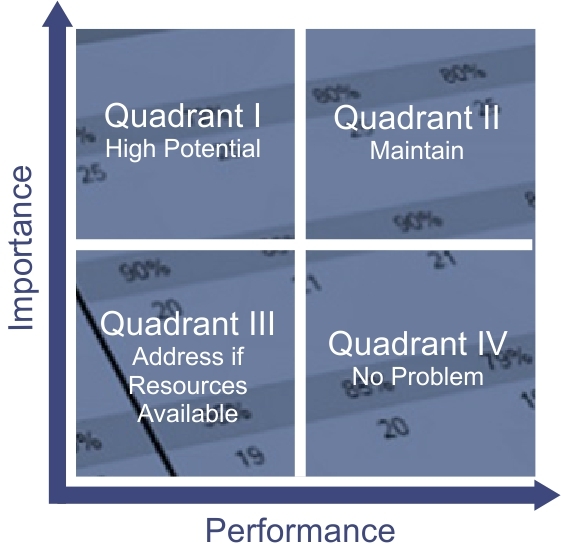 Compliance and service quality are not mutually exclusive. In fact there is a positive relationship between compliance and, not only service quality, but stronger sales. To understand the relationship between Truth in Savings Act (TISA) compliance behaviors and the customer experience, Kinesis mystery shopped five US banks with the objective of evaluating TISA compliance and the customer experience. A description of the methodology is at the conclusion of this post. Employees who correctly quoted APY provided a more satisfactory experience. The overall impression of the entire experience for shops that passed the TISA disclosure requirements was 4.1 compared to 3.4 for shops that failed, on a scale of 1 to 5, where 1 is “Extremely Dissatisfied” and 5 is “Extremely Satisfied”. Beyond the overall satisfaction with the experience, significant differences also exist across all the individual service attributes measured. In all of the following seven attributes measured, shops which passed the compliance test consistently had higher attribute satisfaction ratings. Not surprisingly, there is a relationship between compliance and job competence. Employees who comply with the TISA are more likely to demonstrate competence in other aspects of their job. Job knowledge, confidence in the employee, use of understandable terms, and professionalism are the four attributes with the largest gaps between shops that passed and shops that failed. Additionally, employees who pass the compliance test are more skilled at connecting with the potential customer; receiving higher average ratings for interest in helping, valuing the customer and even friendliness and courtesy. Now, as if compliance risk and customer service were not strong enough cases for TISA compliance, what about the sale? 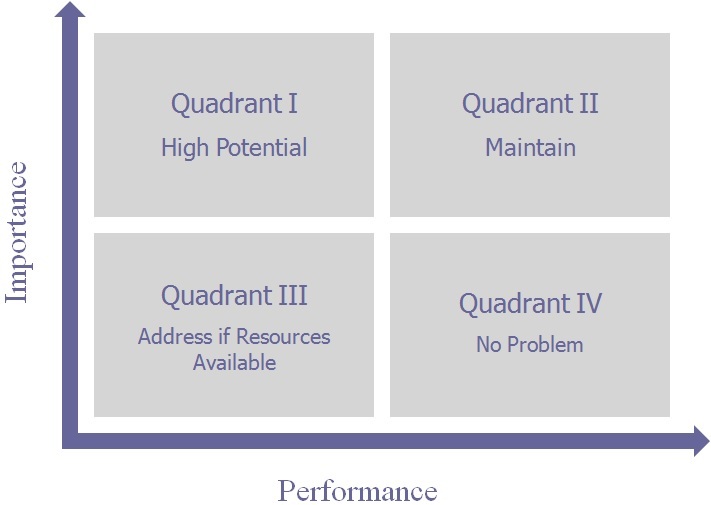 What about sales effectiveness? Shops which complied with TISA requirements had significantly higher purchase intent compared to shops that failed. Shops which passed exhibited a net positive purchase intent of 46% (46% more shops received positive purchase intent ratings compared to negative). On the other hand, shops which failed the TISA evaluation received a net negative purchase intent of minus 9%, (9% more shoppers assigned negative purchase intent than positive). There is a relationship between TISA compliance and the customer experience. Employees who are skilled at compliance behaviors, exhibit similar superior service and sales skills compared to those with weaker skills. Shoppers were asked a mixture of closed-ended questions to evaluate the presence or frequency of specific behaviors, as well as to rate various service attributes with 5-point scales. Finally, to provide a basis to evaluate the effectiveness of each sales behavior, shoppers were asked to rate their purchase intent as a result of the visit. 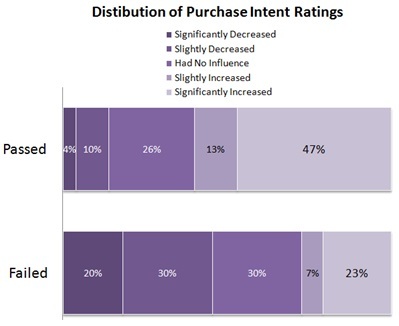 This purchase intent rating was then used as a means of evaluating what behaviors tend to be present when positive purchase intent is reported as opposed to negative purchase intent.